In 2013, 87.8% of Slovakian youths lived with their parents. Three years earlier, this number was only 86.2%. All over Europe, the financial crisis has meant a rise in young people who cannot afford to leave home. Overall, 60% of Europe’s youth between 18-34 years stay at home. The trend has increased over the last years. But despite a common trend, European countries vary a lot, upon closer inspection. 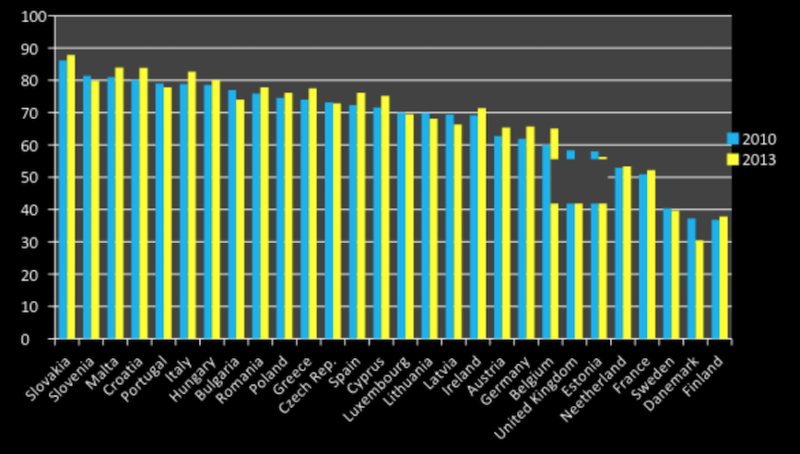 In fact, when we analyse the percentage of young adults (from ages 18 – 34) living at home, There are countries like Denmark, where barely 30% live under the parent’s roof. And countries such as Slovakia, where the percentage is as high as 87.8%. One reason behind this trend is variations in national policies. On one side, we have Scandinavian countries with quite generous welfare, and on the other, Eastern countries who oftentimes do not even have a national strategy for young people, such as e.g. Bulgaria. In this graphic, we can see one of the consequences of the economic crisis and austerity measures approved in several countries. In most countries, this has assisted an increase in the of share of young people who live at home with their parents. Especially Southern countries such as Italy – which went from from 78.9% to 82.7% – or Cyprus – that went from 71.6% to 75.2%. Also Eastern countries such as Slovakia have gone up from 86.2% to 87.8% and Romania, whose share has risen from 75.9% to 77.8%. Nevertheless some countries have gone in the opposite direction. In the United Kingdom, a larger group of youth have left their parents’ home cooked meals behind (decreasing the share from 58% to 52%). Portuguese youth too, have flown from the nest, with from 79% in 2013 as compared to 77,8% in 2010. .